If you are a raw beginner looking to experience the thrill of riding a wave, this introductory lesson is for you! We specialise in teaching first time surfers the fundamental techniques to have you confidently up and riding whitewater waves. Come and 'share the stoke' with our professional surf coaching team and become a 'surfer for life'! Discounts for booking 4 or more people! Small Group Bookings (4+ people) - $40 per person. Discount is applied at checkout. ** PLEASE NOTE: WE REQUIRE 3 PARTICIPANTS OR MORE TO RUN A GROUP LESSON. IF NUMBERS FALL SHORT WE WILL CONTACT YOU TO DISCUSS THE OPTION OF A PRIVATE LESSON OR DATE CHANGE. 2 hours inc set up and pack up. Please meet at your lesson start time at our Van and Trailer parked on the grass beside Coronation Drive in Broulee. We are generally based between Train and Francis Street. If you have difficulties finding us, please call the office (02) 44 717 370. Swimwear, towel, sunscreen and a go-for-it attitude! Soft surfboards to suit your body size, full length wetsuits to keep you warm, and friendly professional advice from our coaches. We run Surfing Lessons in most weather conditions, rain, hail or shine. If the ocean is judged to be dangerous by our staff due to high winds, swell, tidal currents or lightning storms, we will reschedule the lesson. If we change the time and you are unable to make the new lesson, we will offer a credit voucher for another lesson at a later date. If that is unsatisfactory, we may, at our discretion, offer a refund. If you wish to reschedule a lesson you have booked we require 24 HOURS notice. Failing to give the neccessary notice will result in forfeiting the booking value. 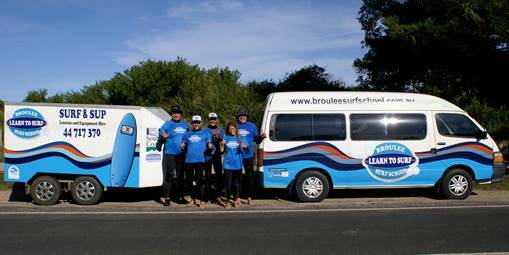 In this instance there are no refunds, partial or otherwise, or transfers to other people or services offered by Broulee Surf School.